Telephoning in English is for professionals and trainees in business, commerce and administration who need to be able to receive and make telephone calls. It is suitable for use in class or for self-study. 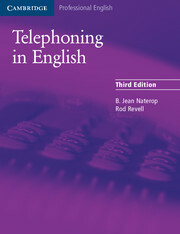 Telephoning in English develops and consolidates practical telephone skills in a variety of interesting and relevant contexts. Activities range from message-taking and spelling practice to role play, providing learners with a comprehensive course in using the telephone in English.